I have another finish to show you today, but first. I have mentioned that I have a new crochet start. And here it is. Growing slower than I would like, because the increasing activity in my wee room is getting in the way! 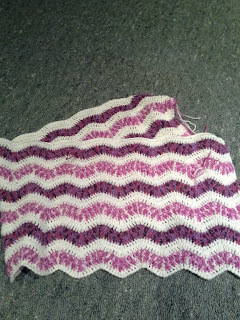 I'm enjoying rippling along in the evenings and loving the variegated pinks. Such a pleasure to work with. And now onto my finish. I sat down on Wednesday to do this but ten minutes in, there was a power cut which lasted for over an hour! Yesterday was my first chance to get back to it. I quilted and bound it on the machine then curled up in the sitting room with Tony and had the binding closed in time to have it on the able at dinner. My boy Joe was here, with his lovely girlfriend. Today, after I get the domestic stuff done I plan to play with some pretty floral fabrics. I've been collecting them up, here and there, never really sure of what to do with them. Now I have a plan. A simple, quick and easy plan. Hopefully if things go to that plan, I'll have at least a top, by the end of today. Right I'm off, the sooner I get to the chores, the sooner I get to have fun. 2 lovely projects there Lou. I am working with florals so will be interested to see how you use them. Very sweet colors in your new ripple project. Glad free time is involving needles and thread! Nice tablerunner. Always good to have a quick and easy pattern for instant gratification in the sewing room. Enjoy! Loving your crocheting and the table runner looks fabulous on the table... Great job.. The runner turned out great. Have fun on your new projects. Your crocheted blanket is lovely. 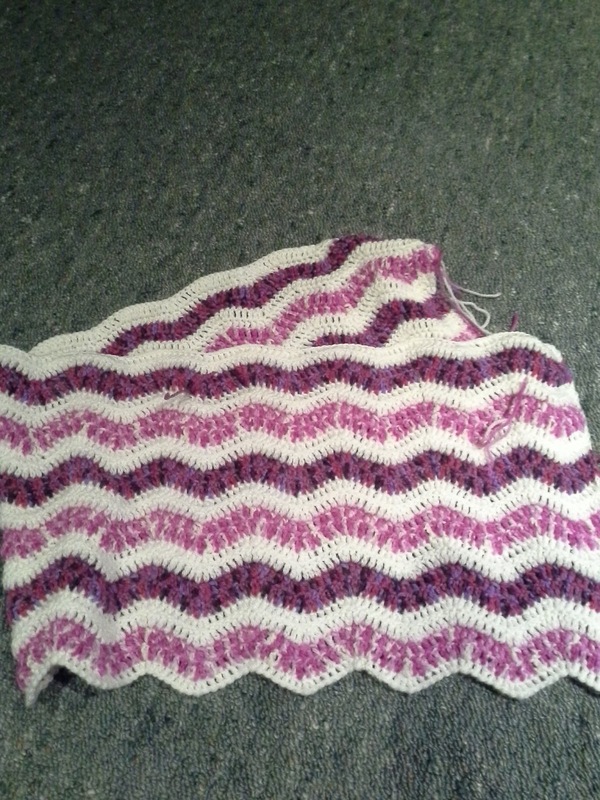 I love the pattern and agree the variegated pinks are happy. And I love when a project is finished. 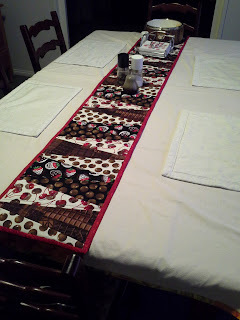 Your table runner is quite nice!